Today, a word with Vira Slywotzky, who will sing Helena at Saturday night's Midsummer Night's Dream. 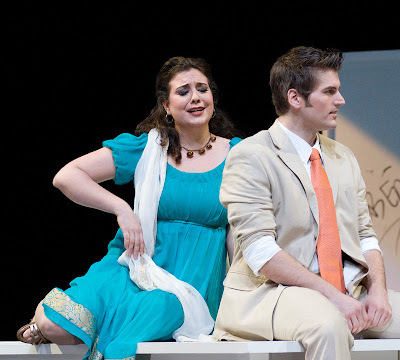 JD: Vira, we're delighted that you're one of Seattle Opera's Young Artists. But this is not your first engagement with the company. Tell us about your past history with us. VS: I had a very academic education in music as an undergraduate at Yale, and was just itching to find out how opera functions in the real world. When I graduated I spent a few months as a music library intern at Seattle Opera. I got what I was hoping for, and then some. I learned SO MUCH!! I'm thrilled to be back with the company - when I arrived in the fall it felt like coming home. JD: Do you like listening to and/or performing Benjamin Britten's music? What makes performing Helena different from other opera roles you've done? VS: I really enjoy listening to Britten's music. This is my first Britten role. It's been a challenge for me because it's so involved - I've had to learn a new language of rhythms, harmonies and musical ideas. Add to that demanding staging and, well, I've had a lot of sleepless nights. But it's been worth it - telling this story in this production is really exciting. And the orchestra! The ways in which Britten uses the instrumentalists to illustrate the story is fabulous. JD: Helena is probably the most developed character among the four lovers. Tell us a little about how she grows over the course of the story. VS: Ah! Poor Helena. She suffers horribly during the first two acts. As the lovers' relationships become confused, Helena endeavors to keep everyone on track: she tries to win back Demetrius, keep Hermia and Lysander together, stay friends with Hermia, and prevent Lysander and Demetrius from harming each other. She loses her cool, though, when she imagines that her three best friends have all joined forces to make fun of her. She demonstrates tremendous resilience and faith when she wakes up in Act III and takes back Demetrius and renews her friendships with Hermia and Lysander. I hope that she never has to experience such betrayal again! JD: What's your favorite moment in the opera? VS: I love the transformation of Nick Bottom the Weaver into a donkey - he really looks and behaves and sounds like a donkey!! And his return to his original form is beautiful - he's so earnest. JD: Thanks, and we look forward to hearing you Saturday night!